Epact: Quadrant unsigned, mid 16th century ? 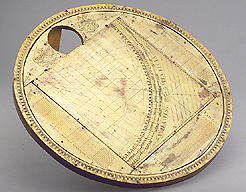 The compass is made of copper plates nailed to a wood base. The rim of the instrument is engraved with a scale of degrees, divided to five, to one and subdivided to 1/3, numbered from 5? to 360? by five with 45? at the top, where the compass is. The rest of the instrument is covered by four copper plates. The top one has a compartment for the compass, now missing, and on the sides are two coats-of-arms, one of which is surmounted by a mitre and crozier, with the initials 'B A Z O'. The right hand side plate is engraved with 'Linea fundamentalis in 1000 partes diuisa', with a series of lines divided in ten units (each unit corresponding to 17 mm). The units are numbered from 1 to 10 and from 10 to 100 in different scales. The last unit is divided in diagonals, numbered 1 to 10 and 2 to 10 by 2. The lower plate is inscribed 'TABVLA PYTHAGORICA' and a multiplication table 10 ? 40. The fourth plate has a similar linear unit scale, where each unit is 28 mm, divided to ten, numbered 1 to 5 and 10 to 50 by five on a different scale. The first and last unit are divided with diagonals, numbered 1 to 10 on each side on the square. In the centre of the instrument is riveted a square copper plate, engraved in the manner of a quadrant. On the borders of the square is a degree scale divided to one by alternate shading, numbered from 0 to 100 by 5 on both sides. The limb of the quadrant is inscribed 'VMBRA VERSA' and 'VMBRA RECTA' decorated with floral scrolls. Further to the centre is a non-linear scale, divided to 10 by alternate shading, to 5, to one by alternate shading. The scale is numbered from 5 to 100 to 5 by 5. Further to the centre is another scale, similarly divided, numbered from 1 to 27, which does not continue on the other side of the quadrant. Further to the centre is an equal scale of degrees, divided to one and to 1/2 by alternate shading, numbered from 5 to 90 by five. The inner side of the quadrant is engraved with a square and numbered radial lines, every 71/2 degrees and numbered from 15 to 90 by 15. Two central lines, corresponding to the degrees 42? and 48? as numbered on the limb, are dotted. The sides of the square are numbered from 10 to 100 in a rather faint and crude script. The edge of the square plate opposite the quadrant's apex is engraved with a set of diagonal lines numbered 1 to 9 and 3 to 1 to 9. The letters 'A', 'B', 'C', 'T', 'D' and 'S' are engraved on the corners. Underneath the copper plate is inscribed in ink 'P Ildephonsus Mahler Monachus Benedictinus ursinij fecit has Machinas D P. Dominico beck oxenhusano ejusde<m> ordinis Religioso ? 1759 . Ursinj Mathesi opera Danti eodem <sub?> magistro'. A steel square fixes the round part to the base of the instrument. The instrument was purchased in 1897 and is described in F. A. B. Ward, A Catalogue of European Scientific Instruments in the Department of Medieval and Later Antiquities of the British Museum (London, 1981), p. 97, no.286.